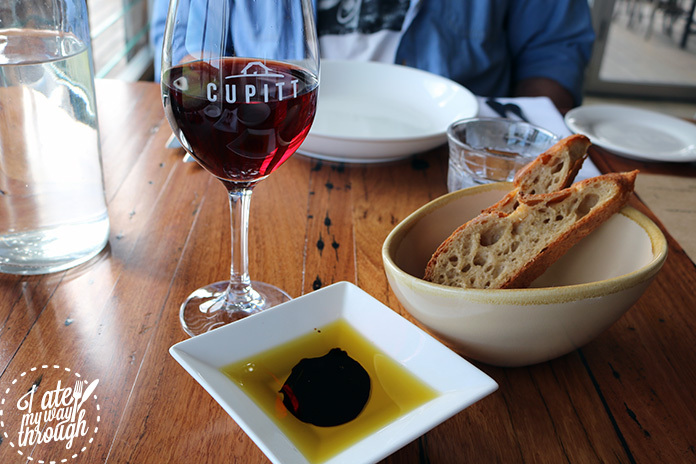 Weekends are made for wining and dining, and Cupitt Winery and Restaurant is perfect for both! Overlooking rolling green hills with Black Angus cows lazily grazing away and the sun beaming down on the back deck, it’s a real pleasure to spend a Saturday afternoon here. 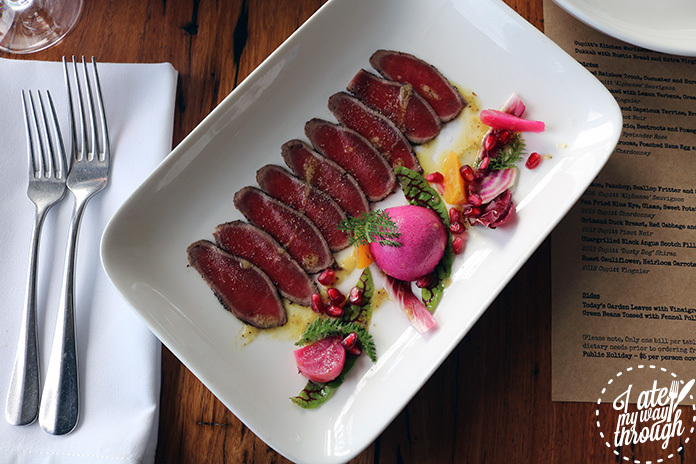 The Cupitt Kitchen, headed by French trained Russell Chin, churns out some fantastic meals made from local produce that will keep you coming back for more. Inside the restaurant, you have the options of two courses for $60, or three for $78. I would recommend rounding out the whole dining experience by adding the matching wines for $19 or $30 with your two or three course meal, respectively. The food and wine are expertly paired so that you can taste the highlights in the dishes which in turn brings to life the tasting notes of the wines. 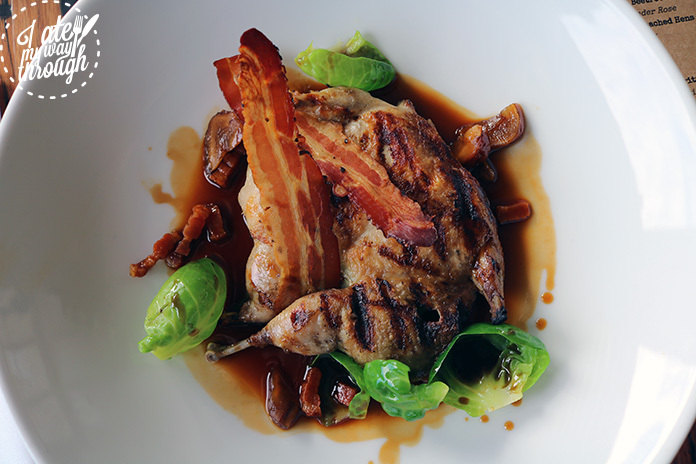 The first entree was the chargrilled, spatchcocked quail served with pancetta, Brussels sprout puree and chestnuts. As a special of the day, I couldn’t resist trying it. The quail was well cooked, the meat was still tender and pulled away from the bone. The pancetta was crisped to perfection, but one of the best aspects of the dish was the Brussels sprout puree. Creamy and slightly sweet, it was a great way to use the vegetable and added a smooth texture to the dish. The venison carpaccio with beetroot and pomegranate was a very interesting dish. The finely textured, gently seared venison simply melted in your mouth and exuded the rich game flavours that you would expect from this meat. The beetroot only added to the earthy flavours of the venison then the pomegranate and citrus dressing gave a fresh zing to heighten the already plentiful flavour profile of the dish. Paired with the spicy 2016 Cupitt Pinot Noir with notes of cherries and forest fruits, this was really a standout dish for me. 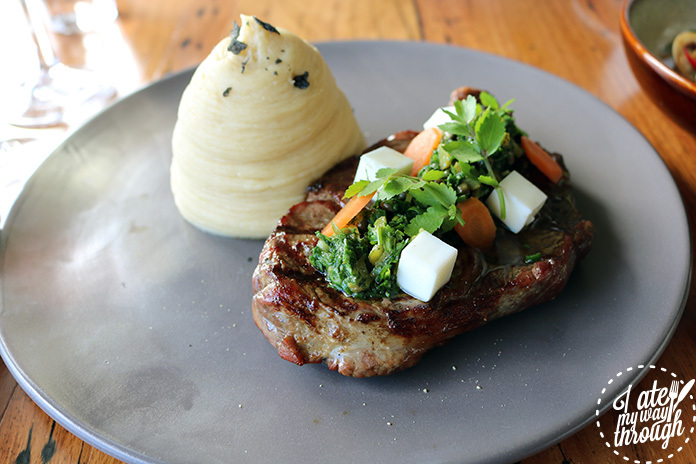 I couldn’t wait to sink my teeth into the chargrilled Black Angus Scotch Fillet. One of the many talents of the Cupitt’s is that they run their own Black Angus cattle on their working farm. 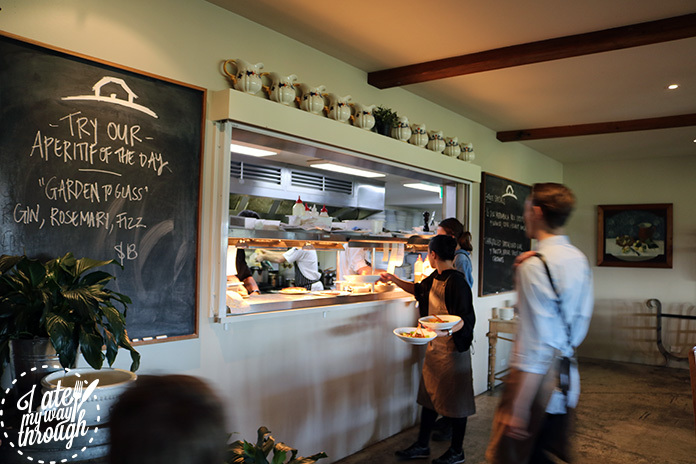 They do this as part of their ideals of being self sustainable and following the principles of the slow food movement, of which Rosie Cupitt is heavily invested in. I had my steak cooked to medium, and the meat was sealed well and retained a lot of moisture and full beef flavour. The steak came with a side of smoked mash and a gribiche garnish. The smoked mash was simply astounding, and the secret is that the kitchen uses old oak wine barrel chips to create this unique smoked flavour. I only wish I could have ordered a side serve to enjoy more of it. 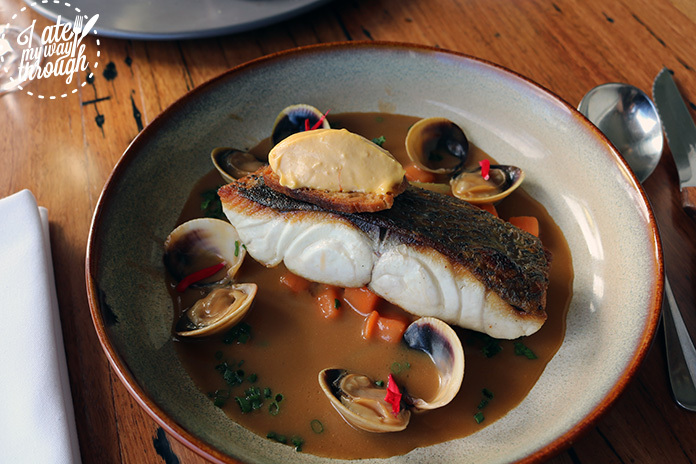 The pan fried blue eye with clams, sweet potato and lobster velouté is an all encompassing dish of the joys of seafood. 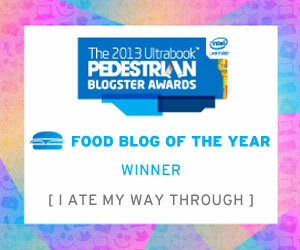 The fish had crisp, fried skin but the meat expertly retained all moisture and delectable fish flavours. This was only enhanced by the meaty clams and rich lobster velouté which for myself had the strongest presence in the dish. This dish was paired with the 2015 Cupitt Chardonnay, a buttery drop with classical citrus notes it really worked with the creaminess of the velouté and fresh fish. My favourite part of any dining experience – dessert! I was especially looking forward to the whey caramel figs, Rosie’s fromage blanc mousse with fig and honey ice cream. Along with the winery and restaurant is also a fromagerie where Rosie Cupitt makes all of her cheeses. Among these is this soft white cheese mousse which like the previous courses was phenomenal. The enticing mousse was aerated and incredibly light, on a bed of biscuit crumble that was perfectly complementary to the fig and honey ice cream. The caramel figs were also quite nice, as were the crunchy, caramelized hazelnuts. 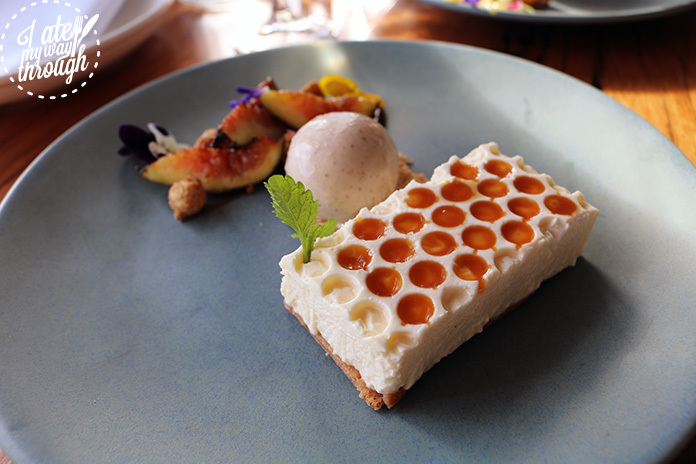 This dessert was paired with the 2011 Tim Adams Botyrtis Riesling, which was full of honey and citrus notes that perfectly complemented the caramelised aspects of the dish and elevated the creamy taste of the mousse. 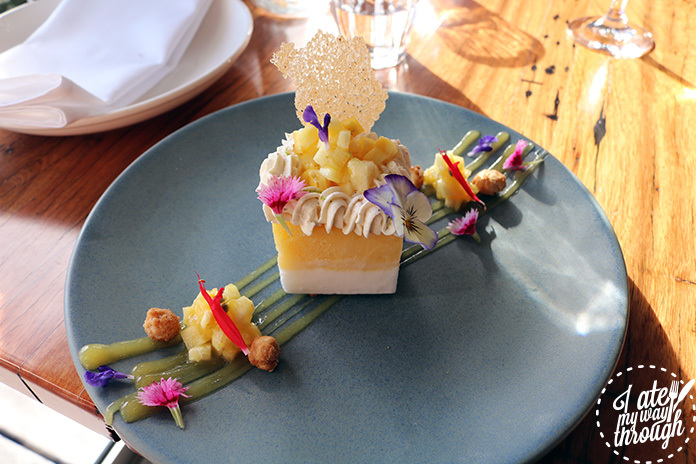 Two desserts are always better than one, and there was no chance of passing up the coconut and passionfruit semifreddo. Tangy passionfruit reins overall in this dish, and is palate cleansing after the other two courses. It was refreshing as the autumn afternoon sun descended through the glass windows, and the fresh fruity flavours bringing back memories of summer. Overall, it was a fabulous afternoon with good food, wine and company. 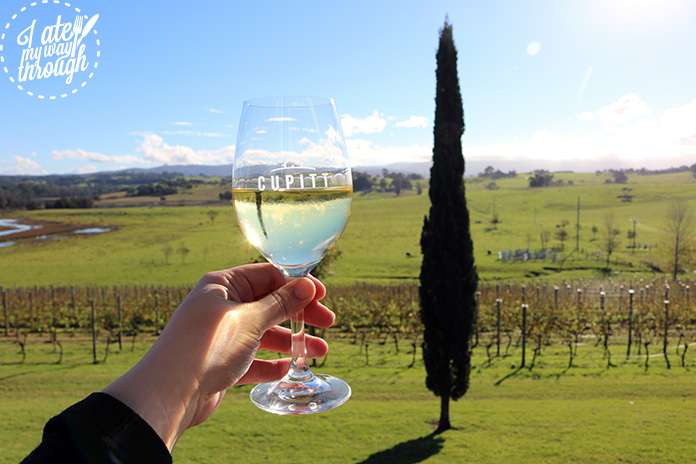 Take a wander around the Cupitt estate, or take part in one of their tours to learn more about this amazing winery. You can also grab a bite to eat and some of their estate brewed beers to enjoy on the back deck. Cheers!